Our reviewers present their Top Ten discs from the past year. Among the artists that show up on multiple lists are Willie Walker, Fiona Boyes, Cephas & Wiggins, Janiva Magness, Jeremy Spencer, Bob Margolin, Charlie Musselwhite, and Paris James. All of the lists can be found in our Pick Hit section. 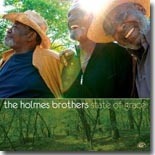 The Holmes Brothers continue to turn out innovative and fantastic blues recordings. Their latest Alligator release, State of Grace, is our Surprise hit for the month. Delmark Records has released a great set of live Junior Wells recordings, Live At Theresa's 1975. It's so good that two of our reviewers raved about it. It's in this month's Flashback section. This month's What's New features new releases from the Joe Louis Walker, Bob Margolin, Terry Garland, Eddie Cotton, Midnight Shift, and the Greek band Small Blues Trap, plus a review of the new biography of Duane Allman.